Play to win or get out of the way. Successful leaders focus on success. Progress, momentum, and growth are precious things. Fuel them with all you have in you. Divert resources from growing areas and high opportunities. Propping up poor performing programs and solving problems doesn’t produce stunning success. Pollute successful teams with poor performers, foot draggers, and complainers. Put chronic complainers on the same team. Listen to complaints from low or slow growth departments. Ask complainers what they want to do to solve their concerns. Leaders who focus on solving complaints end up controlled by complainers. People who feel threatened by the success of others want to stop it. Listening to them makes you a success-killer. Listen to passionate high-performers. Don’t get sucked into the complaints of low performing departments, teams, or team members. Follow success. Pour fuel into successes. Speed up. Don’t slow down. Play to win, even when protecting gains. Focus high performers on opportunity. Assign low performers to problem-solving initiatives. If low performers succeed, promote them. If they fail, reassign or remove them. You might be concerned about putting low performers on the same team. Won’t they know they are low performers? Everyone should know where they stand in your organization. Shielding low performers promotes low performance. Remember that poor performance in one area isn’t a universal statement about a person. Don’t give up on low performers, if you believe in them. However, don’t put low performers on high opportunity initiatives. 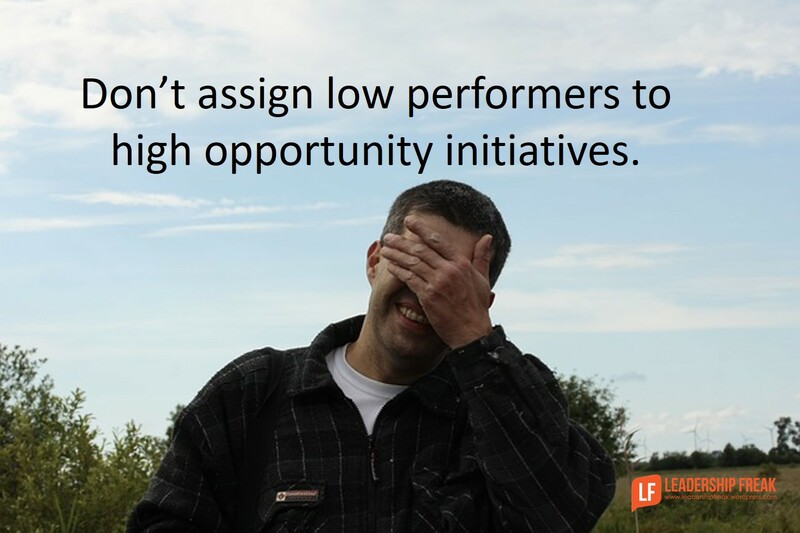 What are some of the dumbest things leaders do when things are going well? What are some of the smartest things leaders do when things are going well? I have a different #1 thing stupid leaders do: valuing consistent deliverers of same old staff over clever risk-takers who now and again fail in pursuing the new – but are on to something potentially great. I see it all the time in many organizations around the globe. I wonder how your suggestion fits these ideas? “Clever risk-takers” shouldn’t be considered low performers. It seems that taking risks is usually one aspect of high-performance. Having said that, I realize that some organizations are very risk averse. People who don’t take risks thrive there. Our attitude toward failure is also part of seizing opportunities. Are we learners or punishers when it comes to failure. Failure breeds failure without intervention, recipe for disaster. “Everyone does need to know where they stand”, spot on Dan! The leaders needs to promote success with the proper personnel. rad- the difference is attitude. Do they dissent with anger or criticize then offer a solution? Those chronic complainers will put you in therapy faster than anything. Is there a rule of thumb for differentiating between constructive criticism/dissent and chronic complaining? How do I make sure I’m not just protecting my own blind spots and insecurities? I’d like to believe that people don’t belong to only one of two categories – “poor or passionate performers.” True, there are those that don’t always perform to the top of their capability. I’d like to believe that the reason for that is that they haven’t found the moment or the niche to show a peak performance. Putting low performers with employees who are passionate or are performing well may inspire or teach or incite new behaviors. Another way to look at it – if I play tennis with a beginner, I will likely not play my best. Put me on the court with someone who pushes me to play better…? I will play better. Some of the dumbest things leaders do when things are going well? Believe you can work your team at 110% all the time, because everyone can work to the bleeding edge forever with no consequences. 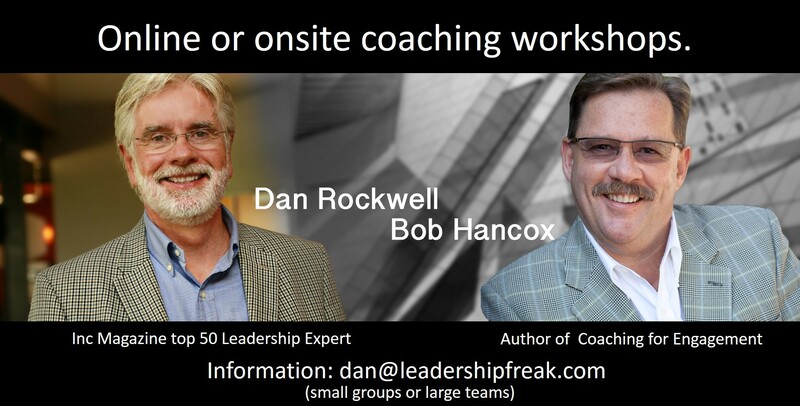 Some of the smartest things leaders do when things are going well? Look for the people you want before you need them – if the opportunity for the right person comes along, get them on board before somebody leaves and you have a critical hole. Our natural tendency is often to look for and fix whats broke, however fueling whats working drives much better results. As Leaders and Managers we try to drag along marginal performers or the chronic complainer way too long, either we just don’t want to deal with it or with think by some form of magic they are going to change and they don’t. We just allow them to infest the team and drag others down with them. Many times it is hard to deal with these individuals and the path of lest resistance is just to let them flounder. All we do is damage the overall performance of the team. So why not just do yourself a favor and cut your losses. This is the unhappy part of management! This is where our education system fails! Rewarding children for under achieving. Everyone gets a trophy for participating. The high achiever gets the same recognition as the child that was just there. Didn’t contribute or really even want to be there. And it’s not done for the child’s benefit but for the parents. Then we wonder why they harbor this false sense of entitlement!